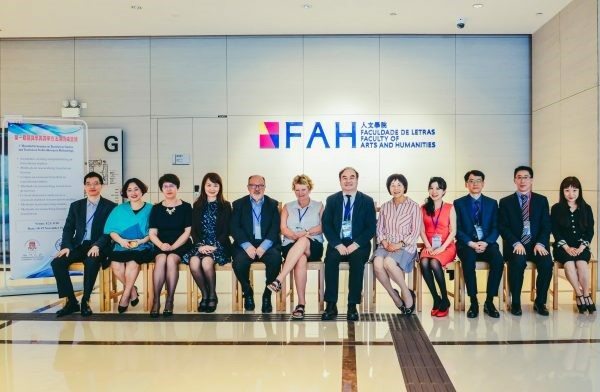 The Centre for the Studies of Translation, Interpreting and Cognition (CSTIC) under the University of Macau (UM) Faculty of Arts and Humanities recently held the First Roundtable Seminar on Translation Studies and Translation Studies Research Methodology. Under the theme ‘Research Methodologies in Translation Studies in the Era of Big Data and Technology Revolution’, scholars from Macao, mainland China, Denmark, and the United Kingdom exchanged ideas on research methods in the studies of translation history, translation processes, literary translation, translation education, translation as a discursive event, translation universals, and interpreting studies. At the opening of the event, Prof Li Defeng, convenor of the roundtable, gave a speech on the rationale for ‘researching on research methods in translation studies’. He stressed that a well-formulated research agenda, as well as a rigorous and reliable research methodology, would be vital to translation studies as an independent discipline. He also pointed out that existing research methods in translation studies have been mostly adopted or developed from translations between European languages, adding that it would be worth exploring if Asian languages such as Chinese, Japanese, or Korean require a different set of parameters and research methods. Giving a critical response to all the presentations at the seminar and commenting on the seminar as a whole, Prof Arnt Lykke Jakobsen, president of the European Society for Translation Studies, indicated that the roundtable was the very first conference devoted to the methodology in translation studies. He added that the event was particularly timely and significant as there had been an increasing amount of data-based/ lab-based empirical research studies in the field in recent years. He also believed that the seminar, which was a success, had helped increasing the visibility of Chinese scholars in the field of translation.